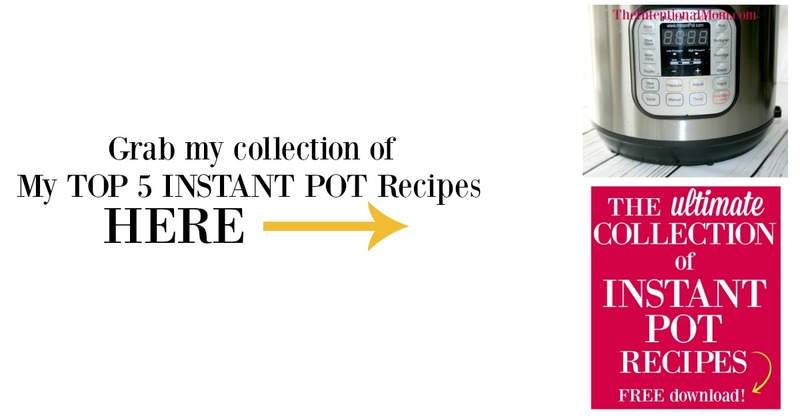 Oh how I love my Instant Pot, let me count the ways…. I will be posting more of the ways I use my Instant Pot, it really is my absolute favorite thing in the kitchen these days. I will even share the reasons why I love it in the coming days. Looking for other quick and easy recipes for your Instant Pot? Be sure to grab our favorite Instant Pot meals. Enter your email below to have them delivered right to your inbox! 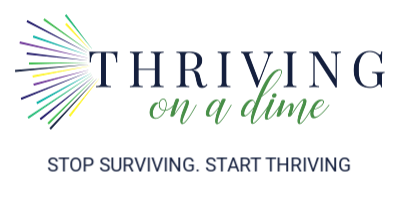 But today, I am so excited to share how you too can make the most awesome baked potatoes in your very own instant pot. Everyone in my family raved about these baked potatoes. And, I actually agree. I think the thing that sets them apart from making baked potatoes in the microwave is how they are so moist. The texture is also pretty much the same as when I cook them in my oven (which is the way I used to prefer them). I really am not a fan of dry baked potatoes. Another thing I like about this method is that they are easier to take them out of the peelings than they are when you cook them in the microwave. I have a few little kids who refuse to eat the peelings yet. First off, this is the Instant Pot that I have, and it has been the best thing I’ve ever bought for my kitchen hands down. Just click on it for more details. So easy, and these will be the new family favorite in your home when it comes to potatoes. And, if you don’t have an Instant Pot, you need to get one. You really are worth it! *Please note: Others who have commented on this recipe that cooking time may take longer with potatoes that are larger than medium. I think this is also the case if you are cooking only a few potatoes at a time. So, in the case of larger potatoes, increase the cooking time to 15 minutes, following the same process. Looking for more recipes for your Instant Pot? Check it out for shredded chicken HERE. Here is how to use it for hard boiled eggs. you’re welcome! Love my Instant Pot and use it all the time with my large family! Does not work for me. I have tried one medium sized potato at a time with a time anywhere form 10 to 20 minutes and I still get a hard center. I give up. shoot!! I haven’t ever tried it with only one. Have you tried it with more than one? Like to fill the bottom of the pot? I wonder if this is why? Late to the game here but I just got this same result, the outsides were cooked beautifully but when I tried to open them up the core was hard. I noticed on my IP on manual it auto set to the low pressure setting, I’m going to try high pressure for 10 minutes and see if that fixes the problem! Hi! Thanks, I can’t wait to try them! Just wondering QR or NPR? So you put potatoes in over half of the pot? hmmm. That’s a great question. I would say they probably fill about half the pot. I never really paid attention to how much of the pot they take up. Half is probably about right. The photo shows a completely full IP, I think is why the commenter askedthis. Was that just a staged photo? The streaming basket probably lifts the potatoes up a but to make them look higher in the pot. That is an excellent point! I bet so! I have 6 people in my family. Would you recommend the 6 or 8 qt InstaPot? I’m sure that an 8 quart would be wonderful, but I have found the 6 quart to be sufficient for my family. Not a lot of room to make extra, just enough to get through each meal. Can you roll the potatoes in course salt before cooking in the I-pot? 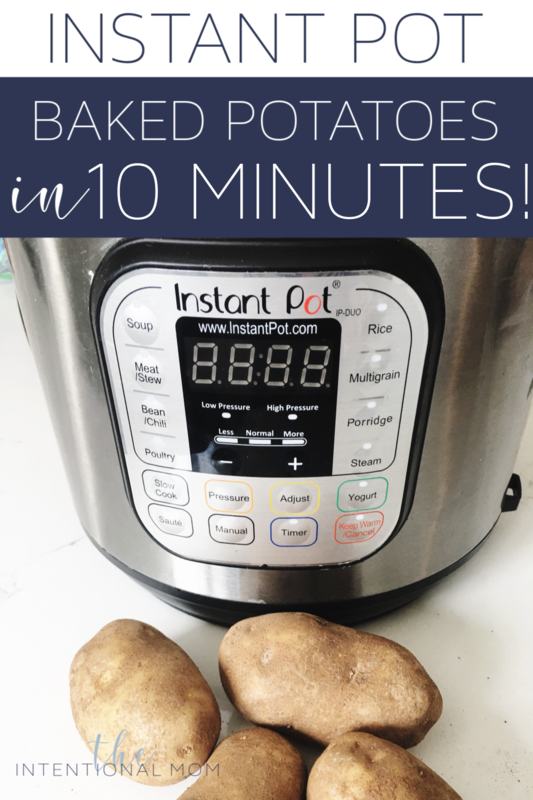 I’ve done that in the past with a roaster, but it takes a LOT longer to cook 10-12 potatoes and I want to use my Instant Pot. Like you, I love it! Hi! I’m really not sure. I have not personally tried this. If you do, please come back and let me know! So I want to make potato salad. My salad is potato egg onion and mayonnaise. So the potatos get done enough for potato salad. I have always made it by boiling the potatoes with skin on (then I take skin off once cooked) then dice. Have you tried these in the IP yet? Just tried this with 4 medium potatoes and they were a bit hard in the middle. I zapped then for 4 minutes and they are delicious. I’ll try 15 minutes QR next time! Thanks for the post! Hi Jennifer, Just want to tell You how much I enjoyed this Site. I been here a while, clicking on differ things. I haven’t any young children living at home any more. My oldest Daughter is married with three Boys of her own. I plan on reading more of your blog. It’s very impressive. Thank You for a lot of fantastic ideas. I will put it in my favs. & return. It makes for GOOD Reading! Thanks. Thank you so much for letting me know, Victoria! Hi! I just tried this, and the potatoes were a little too hard. Maybe my spuds are a little larger? I used regular russet potatoes. I’ll try 15 minutes next time. Thanks for the guide! Bummer! Let me know how they turn out at 15 minutes! I got my Instant Pot in May but I haven’t used it yet! I thought baked potatoes would be a good place to start, but already I’m confused because mine doesn’t have “manual”. Do I use “steam” instead? Also, does the “keep warm” need to me on? Thanks! Hmmm. I’m not sure. Maybe yours is not an IP brand? I would check your manual. So I cooked 5 med to large potatoes for 10min on high. Not quite cooked through. Will bump up the time and or cut them in half. Thank you Jennifer for this post! 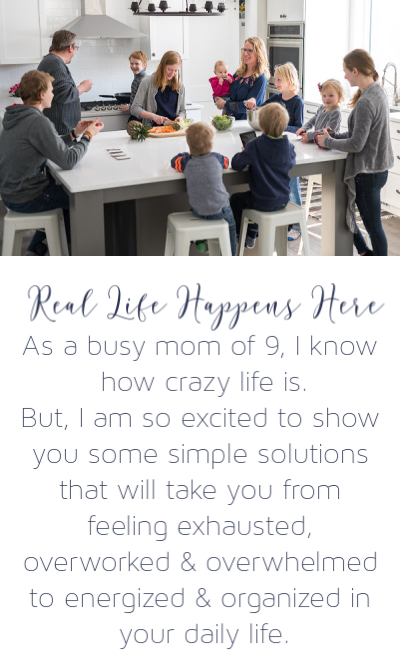 I’ve had my IP since June, and man oh man is it making life easier for this mom of 5! I’m so sorry those weren’t cooked through. Yes! I couldn’t live without mine! Thank you for reading! Let me know if the extra time helps. I tried this tonight with 2 potatoes following your directions. After 10 minutes they were still really hard so I cooked them 10 more minutes and I still had to cook them in microwave to get them done. Hmmm. I’m sorry! My best guess is that your pot wasn’t pressurized properly. I would check that next time! I tried as you said and potatoes were still very hard. Do you quick release the pressure after the 10 minutes or do you let it naturally release? This can make a huge difference and you don’t state that anywhere. I have done it both ways and the results have been the same. I have made baked potatoes in my IP several times using this method and the shortest time I can use and have them cooked through is 20 minutes for small potatoes and 25 for medium-large potatoes. hmmm. I wonder what the difference could be. I wonder if how many you are making makes a difference? I’m not sure. Sorry it didn’t work at the 10 minutes for you. Made these tonight, put 10 medium sized potatoes, cooked for 15 minutes on high pressure and that was probably 2 minutes too long, but they tasted great! Thank you!! After reading the comments here, I have noticed that many users had the same issue of uncderooked potatoes. Being a new IP user, I have to wonder why there are so many variations. I would think that if you fill the pot half way full of potatoes, the cook time would be close to the same. What causes some people to have success and others not so much? Honestly, I think it is the size and maybe even the variety of potato. I recommend just poking the potato after 10 minutes. If it doesn’t feel done either put it back in the IP again or pop them in the microwave. I also tried these and the potatoes were still very hard after 10 minutes and QR. Sorry about that. I’m wondering if the variety/type/size of potato really does play a large role? I’m not sure. It’s just 10 minutes for me every time. And, I’m not sure if a full pot verses a not full pot makes a difference? Mine is always full with a large family. Jennifer, I forgot to ask. Could I use red potatoes in an instapot? If so, what would be a good way to prepare them. I know they’re different than baked potatoes, but I’m curious to see if there are any good instapot recipes for red potatoes. If so, please post them (or if anyone else has any, let me know). Hi! I really have no idea. I have not tried using them. Sorry! Thank you Jennifer for this post! I’ve had my IP since June, and man oh man is it making life easier for this mom of 2! I think there would be a couple of days a week when we would eat cereal for dinner without it! This is quite simple recipe, but nice taste. Instant pot can “produce” many delicious recipes with easy, fast, and delicious meals. I would love to test with more ingredients. Thanks. Thank you, Jennifer, for this post! Baked potatoes are LOVE, Thanks Jennifer for the lovely information you shared with us. Thanks for this valuable information but Do you quick release the pressure after the 10 minutes or do you let it naturally release? Thanks for this valuable information. Do you have any other recipes of instant pot? Do you have any other recipes of instant pot? Please share with us. I know this is an older post, but if anyone is wondering, the freshness/age of the potatoes makes a difference in how hard they are or how long they take to cook. Well that is awesome to know! Thanks for sharing.